When rebuilding trust with your partner after cheating, lying or some other form of betrayal, having clear agreements is a must. This is a delicate time in your relationship when, hopefully, both of you are working to learn and move forward from whatever happened in the past. 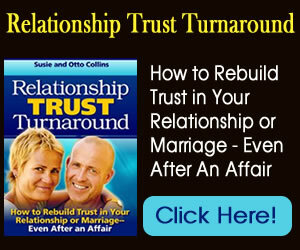 It’s likely that you both have different ideas of what is required and what is the best way to rebuild trust and repair your connection. You might assume that your partner already knows– or should already know– what it is you want. If he or she had an affair, you might take it for granted that your partner knows how important complete transparency is to you. You might also believe that the way you define “complete transparency” will be the same way your partner defines it. One of the biggest causes of conflict and tension in a love relationship or marriage is miscommunication (or lack of communication). This is especially true after trust has been broken. If there ever was a time to communicate honestly and clearly and to create conscious agreements, this is it. It could be that you’ve already attempted to create agreements with your partner, but this was a sheer disaster! Perhaps you thought you had an agreement only to later discover that he or she didn’t understand you at all– or maybe it seemed like your partner didn’t care enough to follow through on the agreement and never did. If this has been your experience, you may be thinking that creating agreements is pointless and a waste of time. There are so many ways that creating an agreement can go awry. The agreement might feel more like a demand or ultimatum. isn’t realistic or do-able given the circumstances of your lives, this isn’t a conscious agreement either. The agreement might be fuzzy or wishy-washy. The agreement might be stated in the negative (you’ve said what you don’t want, but not what you do want). The agreement might not be realistic or achievable despite best efforts. Unfortunately, what feels to you like an agreement, might seem more like an off-handed comment, a hostile statement or a confusing mess of words to your partner. This is why, when you ask your partner to make an agreement, it’s so important that you do so consciously and clearly. Have you ever left a conversation– either with your partner or someone else– and realized that you didn’t actually say what you really wanted to say? Maybe the topic strayed; possibly you felt uncomfortable saying this important thing; or maybe the main point you wanted to make didn’t occur to you until after you walked away from the conversation. Before you sit down to talk with your partner about the ways you’d like to rebuild trust, be sure that you are clear about your priorities. Get really clear about what you’d like to see changed, what the core issues are for you and what you are willing and unwilling to do. As you talk, be clear and specific. Again, remember your priorities and offer details and examples to convey what you mean without bringing in blame or criticism. For example, rather than lay out the judgment that your partner is “insensitive” for not calling to let you know he or she will be late, talk about how it feels when you’re waiting to have dinner together and worrying about what has happened. When you two begin to formulate an agreement to address the issue, make sure that it is specific.Use examples and talk about possible scenarios relating to the agreement so that you both fully understand one another. One reason why many agreements are broken is that BOTH people did not truly agree to them. If your partner says “Yes” just to get you off his or her back or to avoid an argument, that’s not a conscious agreement. Or, if the agreement sounds good in theory but isn’t realistic or doable given your current situation, that’s also not a conscious agreement. It can also be helpful for you to intentionally give space after proposing an agreement so that your partner can really think about it and ask him or herself, “Am I really willing to do this?” before answering you. Remind yourself that it is more likely that you both will follow through with the agreement when it’s made in an honest and free way. Make your agreement specific (in terms of time-frame and behavior) and phrase it as a request, not a demand. Whenever possible, make your agreement apply to both of you– even if you’re not the one who cheated or broke trust in another way. Creating an agreement that you both will follow can encourage a sense of working together toward the common goal of re-connecting instead of one of you being singled out. After you’ve proposed your agreement, really listen to what your partner has to say. Feel into yourself to know how flexible you are willing to be. Once you two have come to an agreement that you both honestly say “Yes” to, repeat back the agreement to one another. This will help ensure clarity and accountability. If this all sounds too formal and “business-like” to you, it doesn’t have be that way. Try these techniques and apply them with love and sincerity.